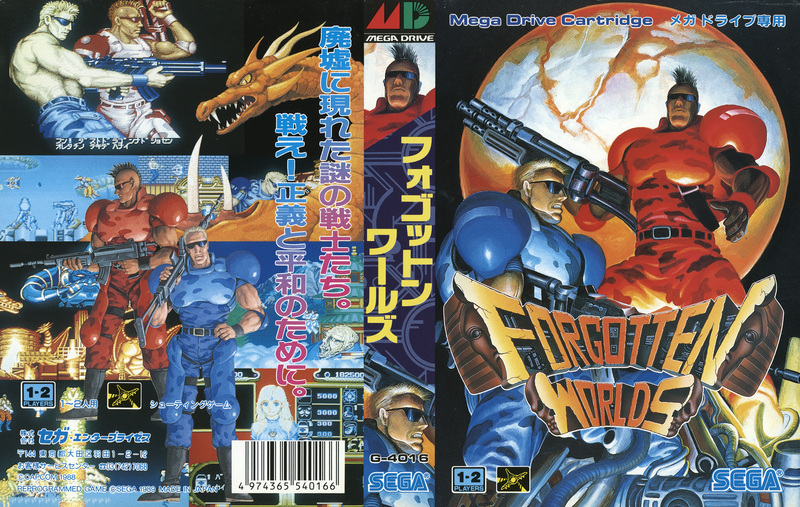 The detail on Japanese Mega Drive covers never ceases to amaze. Those guns are as big as my entire body. Forgotten Worlds is a hootenanny bro-down, an unconventional shoot-em-up where you don’t control a ship, but a hovering muscleman (or musclemen if you’re fighting alongside a comrade). The musclemen have no names – or shirts, for that matter. They were trained by a futuristic people for the sole purpose of destroying their evil emperor Bios and his raging god squad. Rather than revolt against their trainers and strike out alone, they complete their assigned task with your standard issue machine gun and an invincible, hovering satellite that accompanies them and shoots out a variety of deadly weapons. These heads won’t explode themselves! Your musclebound warrior isn’t controlled like any ol’ levitating human with a spare satellite, oh no. In the arcade, an eight-way joystick controls the movement of both your character and the satellite, while a grey rotatable button controls their aim and firing. This way, you can move your character anywhere on the screen, while keeping your shots focused on one specific direction. When you rotate your character while firing, your satellite rotates with you, but when you rotate your character without firing, the satellite will rotate around the player. Sounds like a hassle, eh? I haven’t played the arcade cabinet, but the setup sounds like it works better in practice than on paper. 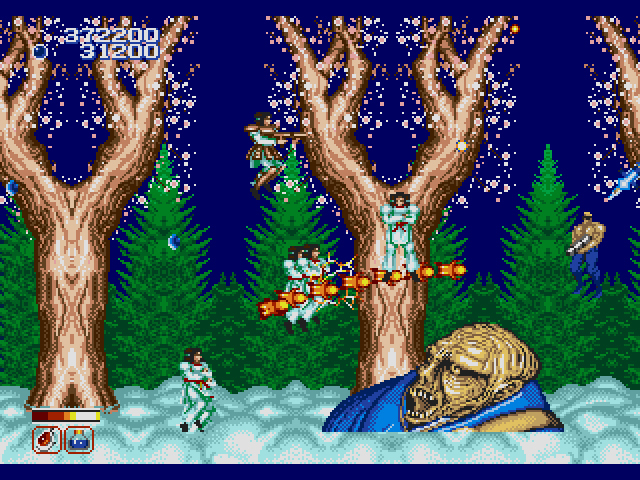 In the Genesis version, the ‘A’ and ‘C’ buttons rotate your position, while the ‘B’ button fires both the machine gun and the satellite simultaneously. I can’t compare the arcade and Genesis control schemes, but the Genesis setup takes some getting used to. You naturally want to control the direction and aim of your character with the D-pad, not a button. Thankfully, the game’s easy enough on Normal that you can fumble with the controls and still not do too badly, but I never got completely used to them. As you wrap your brain around the unorthodox control scheme, you’ll also need to take care of yourself. The shooting is slow-paced compared to other shoot-em-ups, but enemies are still plentiful. Because you can position your character in any direction, enemies appear from every direction possible in clusters of three or four at a time. You start off with one life, a short life bar, and a mediocre weapon. The enemies drop blue coins known as “zenny,” and you’ll need to collect as much as you can for when you to get to the shop. Here, you can buy a refill of life, life potion that refills your bar when you die, stronger weaponry like automatic missiles and lasers, stronger satellite, tips for boss battles, armor for additional hits – whatever you need. In the first couple of levels, you’ll get a ton of zenny and consequently feel pretty safe. As the game progresses, however, fewer and fewer enemies drop it. Staying alive eventually becomes more a matter of saving your money for the better weapons and not getting hit, rather than just the latter. While Forgotten Worlds is pretty enjoyable while you’re playing it, outside of the screen-dominating War God boss battle and the funky controls, you’ll be hard pressed to remember much about the game once you’ve finished. The cutscenes that bookend each stage provide some silly quips for the main characters, but the characters themselves aren’t particularly endearing (hard to bond with someone when they’re not even given a name). The level design is barren and repetitive (Capcom really liked the metropolitan wasteland and Egyptian tomb motifs). While the graphics might be leagues above the recently reviewed Super Hydlide, they’re not nearly as crisp as Sega’s other Capcom port, Ghouls ‘N Ghosts. The shooting is addictive and that’s what counts, but Forgotten Worlds would be more memorable if there was more soul packed between the muscles. Is that a forgotten world behind him or an explosive rear-end mishap? Forgotten Worlds on the Master System was confined to Europe, and well, I’m sorry European friends. Unlike Ghouls ‘N Ghosts which actually benefited from a downgrade, Forgotten Worlds plays like it could collapse at any moment. Killing hobo monsters in 8-bit just isn’t the same. Naturally, Forgotten Worlds can’t compare to its 16-bit brother in scope and size, but the biggest difference between the two games is the automatic firing. Because the Master System’s controller only has two buttons compared to the Mega Drive’s three, the game automatically fires for you (the Genesis version has autofire available, but it can only be turned on in the options menu). You’d think this would make the game easier, but on the whole, I had a harder time with this version. Enemies give you less zenny (on Normal mode, anyway), so it takes longer to upgrade your gear. The frequent slowdown – normally a blessing in faster paced shoot-em-ups – seems only to affect your progress, not the enemies. As a result, their attacks reach you before you’re able to maneuver out of their way. 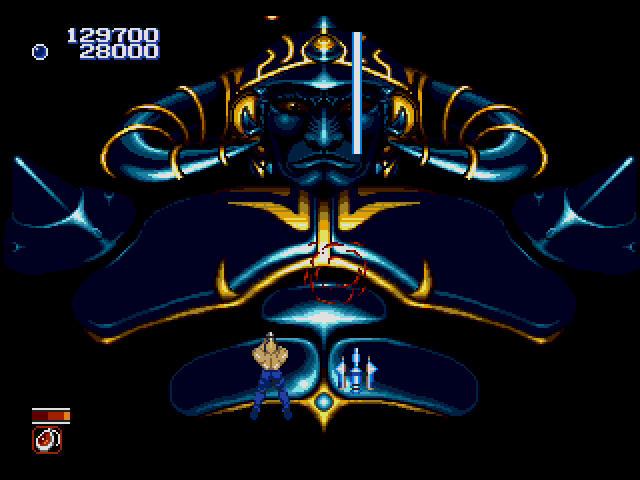 The War God Boss still looks astounding, particularly for an 8-bit console, but if you’re a lonely soul in need of a Forgotten Worlds fix, best to stick with the Genesis or arcade versions. Forgotten Worlds is my favorite arcade game, but home versions don’t do it justice. The Genesis version was actually one of the home conversions with adequate controls, but the inability to whip around the satellite precisely and quickly limits your ability to use it as a bullet shield. The main appeal of the game, though, comes from 2 player cooperative mode. When you have two players, it’s possible to adjust satellite position and aim to give each other cover fire–especially from the places where waves of little enemies shower across the screen. Also, with two players you could coordinate interesting strategies to concentrate zenny collection to one player (there are places where a single player can’t collect all of the big ones, so this leaves enough for the other player to still maintain decent armament) in order to maximize score. And that’s really where the main interest lies. The game itself is not too difficult to complete with two players, but maximizing score involves figuring out how to spend the minimum amount on just the level of armament you need to complete it. 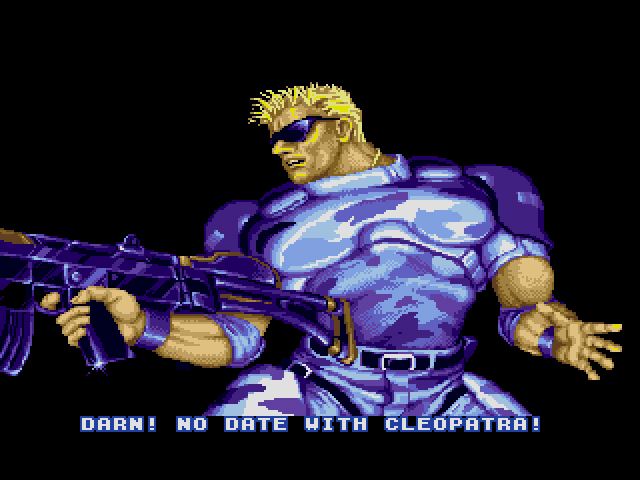 The Sega Genesis version actually retains these aspects best of the home versions of the era, because it alone had two player capability. It comes at a significant cost to the graphics and lost stages, but the basics are retained. Ultimately, though, the main thing that makes Forgotten Worlds stand out is the fact that it’s kind of the only multi-directional shooter with forced scrolling progress. As such, there’s nothing else that quite feels like it. 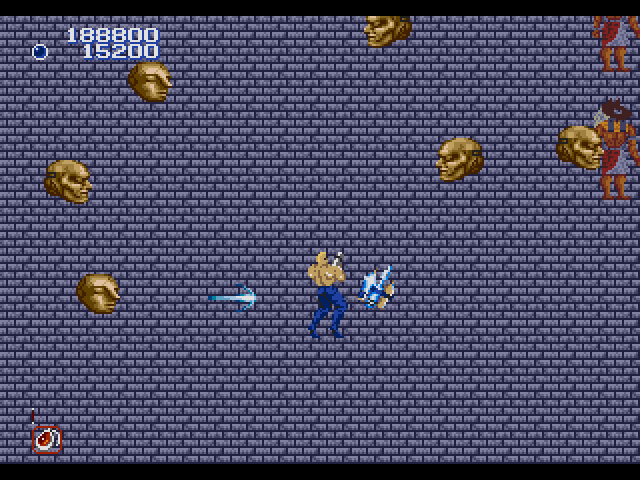 As with other forced scrolling shooters, gameplay involves memorizing where the enemies will pop up, according to the scrolling background. Unlike other forced scrolling shooters, you must really use the whole screen, pre-rotating your aim direction to where those enemies will appear. This comment is better than my review. Thanks for posting! I have nothing else to say. Great comment. Ok maybe a little. I had one of these arcade machines at a 7-11 by my house and played it ALL the time. The control does work great in the arcade. The spinner allows you to spin your weapon as fast as you want or aim as slow as you want. It works really well. I also love the variety of the weapons in this game and powering then up. You can play through without using half the weapons. Some weapons may be ill suited for a certain level but if you hold onto it it’s perfect for an upcoming level. Like the gun with bullets that bounce of the walls is ideal for the enclosed Egyptian levels. Or you can play it to save up for the ultimate weapon available in the last level to clean up. With two players we’d often strategize in which weapons we’d upgrade to to optimize our strategy. There are so many ways to play this game. Also worth noting is your shots are boosted in two player when you get close to your partner you generate a field that increases weapon power of both players shots. Thanks for the comment, Sean. The game won’t even play with a six button Genesis controller. It instantly sends you to a Game Over screen when you try to play. Yes with the six button controller you have to hold the mode button on before and while turning on the game . This game is rather infamous for that when people try and play it now they go WTF , it’s not working. 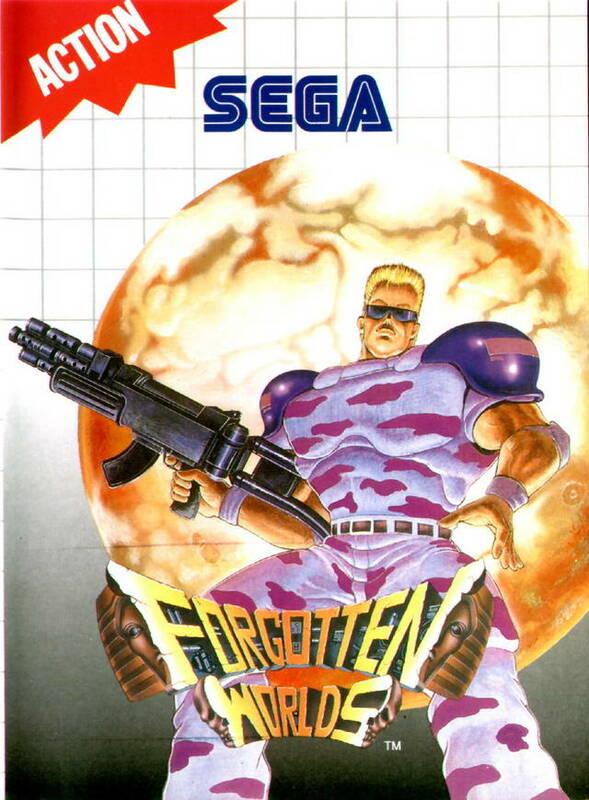 I don’t know why but whenever I look at the cover of this game I think of Contra. There’s a definite Contra vibe going on here.